Guernsey Ladies rugby coach Chris Griffiths is confident the club will impress when they play their first competitive match in the UK on Sunday. In 2012, the Rugby Football Union banned them from playing in an English league because of their location. "We felt we deserved a shot at the league," Griffiths told BBC Sport. "We have played a lot of friendlies against opposition within the league and we had been beating them, so you do think we are capable of doing it." Guernsey's first match is against Ellingham & Ringwood Ladies. Fellow Channel Island side Jersey Ladies have played in the Hampshire League since 2010 but the RFU then chose not to admit any further offshore teams to the National Leagues. Costs and logistical problems following Jersey's inclusion into a UK league continued to be the main reasons for Guernsey's exclusion, but the RFU relented earlier this year, with the Ladies set to be a part of the National Challenger South East South 2 League. Griffiths hopes being allowed to play in the UK, and the success of England Women's World Cup campaign in August, will increase the number of younger females trying out the sport in Guernsey. "Moving into the UK league is a huge boost all round," he continued. "Hopefully it will help get greater numbers playing at school level and younger age groups, but also improve the awareness within the public eye and more supporters for the ladies game. "A lot of people have a particular view of women's rugby which, until they come and watch a match, can be very negative. "Part of our remit this year is to get the awareness of women's rugby up there with the men's and being part of a UK league will only help that." 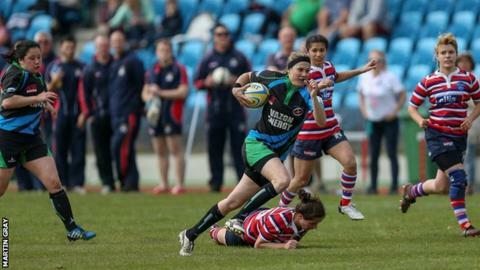 There have been added positives from Guernsey's belated inclusion into a UK league, with the Guernsey rugby association putting extra emphasis on getting girls involved in sport at a younger age. A new Under-15 academy has been set up and Griffiths believes it is a vital step to ensure the longevity of the women's game. "In the last couple years in Guernsey, rugby has grown," he continued. "The Guernsey Rugby Association decided that, because the women's team is doing so well and moving into a UK league, there was a need to bring through the younger players at an earlier age. "You cannot just wait for the girls to turn 20 and then expect them to take up the sport. To get them to play in schools and develop their skills, they need to start younger."